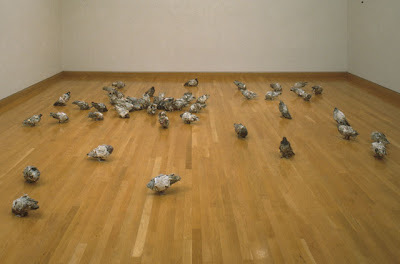 For the creation of sculptures shown above and throughout, artist Kathryn Spence used found and gathered materials to create seemingly shabby sculptures of life-size pigeons and owls, that upon stepping back, resolve themselves into convincing presences in the room. These figures observe us from the corners of the room or the floor, watching (and perhaps judging?) us.
" 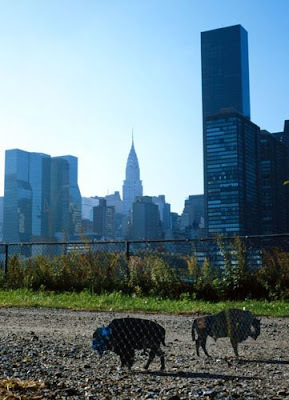 The city's so dirty, you just don't have access to nature. So I was happy to even see pigeons on the concrete. I started trying to figure out what to make them out of. I'd see newspapers run over by cars and think that they looked like dead pigeons. So I started gathering up the newspapers and street garbage to make the pigeons." "A lot of the clothes were my clothes—coats or pants. I liked the ones that looked sort of natural—like herringbone for the back of the great horned owls. 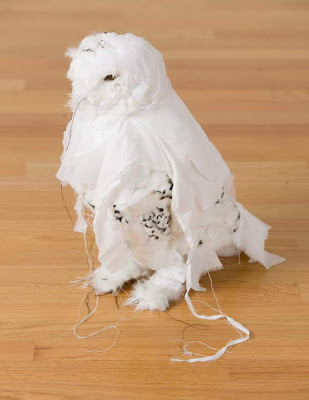 I started ripping up some of my clothes, whatever seemed like an owl to me. There is so much stuff; there's no reason to use new stuff. I feel like I'm helping in some kind of absurd way." 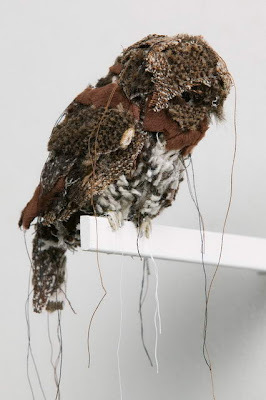 Spence observed all but one of the owl species depicted in the wild, and then used taxidermy models to assist in their sculptural recreation in the studio. 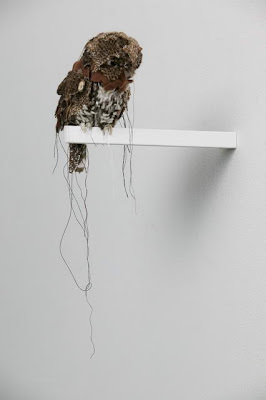 The owls hang interestingly inside of illusion --- both being easily visually deconstructed into their component materials, but simultaneously seemingly possessed of strong animus (not in the Jungian sense, but as in 'vital spirit'). Spence's sculptures are simply a pleasure to look at. 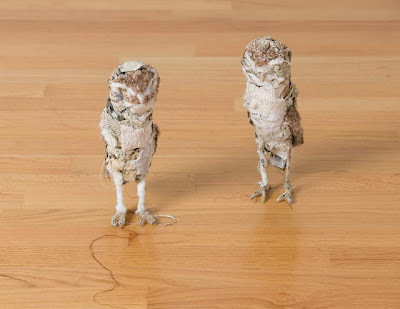 They are beautifully and surprisingly crafted, transcending their ordinary materials. 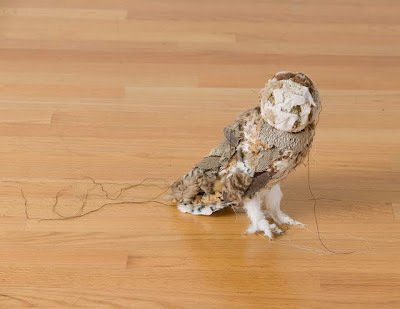 With bodies made from the leftover goods of a consumer society in overdrive, Spence's owls cannot help but make us think that our current crisis of 'unlimited goods vs the Environment' may present us with a choice --- Owls or Beanie Babies? I know what I'd choose. 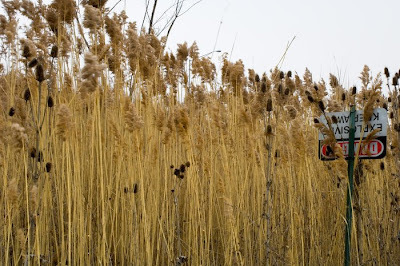 Video artist Sam Easterson attaches harmless cameras to the backs of different animal species, so that we can share a ______'s eye view...in this case a buffalo's eye view. I found this unedited footage, mostly of the buffalo drinking and grazing, but near the end a few shots of the buffalo walking in its herd and locking horns with a rival. Go ahead and be 'one with the buffalo' for 5 minutes. The sounds of it's breathing, snuffing, snorting and slurping are truly amazing. Enjoy! 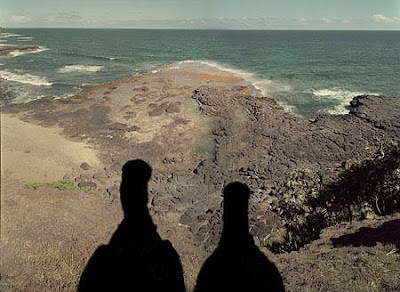 I first became aware of Harri Kallio's work from a show postcard I received for Ecotopia at the ICP (International Center of Photography) in 2006. 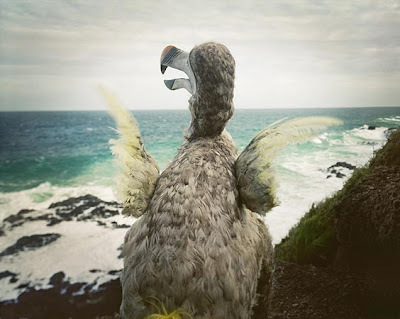 His peculiar photographs of life-size sculptural reconstructions of the dodo, possibly the most famous (and bizarre looking) of extinct birds, get at a funny place in the human psyche. It's hard to know whether to chuckle or sigh. 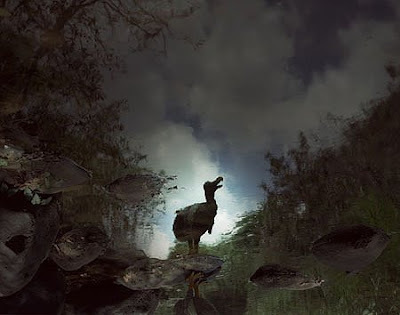 The dodo, Raphus cucullatus, though ostrich or vulture-like in appearance, is in fact, a giant island dove, which lived only on the lonely isle of Mauritius, one of the French Mascarenes. The first written account of a living bird was perhaps that published in 1601 by the (ever-so-eloquently named) Dutchman, Jacob Cornelius-zoon van Neck. The last may have been penned by Benjamin Harry a mere 80 years later. 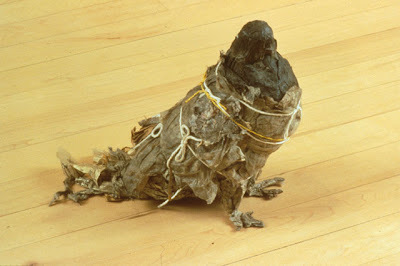 The dodo had vanished into the annals of the extinct in the late 17th century. 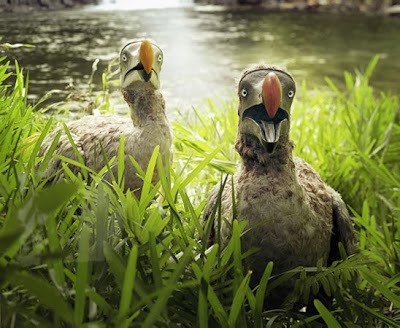 The dodo's extinction came to be through an unfortunate combination of circumstances. 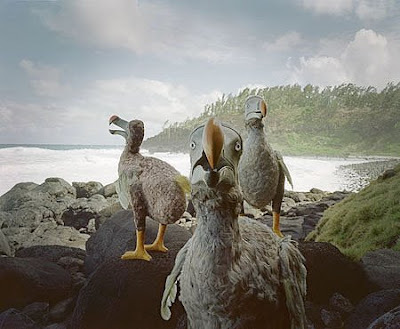 Being an island bird, the species had no natural fear of humans. Added to this, dodos were flightless, and according to most accounts, clumsy and fat. Though it is popular notion that dodos were killed off for their meat which was used to stock sailing ships, it is widely written that their flesh was actually unpleasant tasting and tough. It is more likely that they were yet another victim of introduced species: rats, cats and dogs that feasted on the dodo's ground-lying eggs. When added to the rapid habitat destruction caused by over-eager human beings colonizing the island the dodos had little chance. You can see more of Harri Kallio's work on his website. 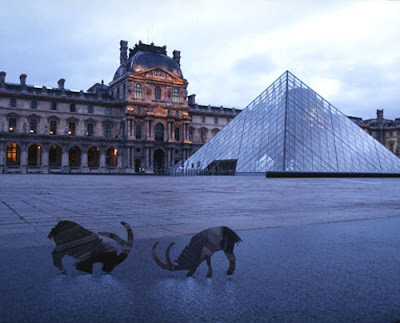 In their Native series (above and throughout), mirrored sculptures of animals are placed in the urban environment as sculptural installations which are then documented with large-scale photographs. 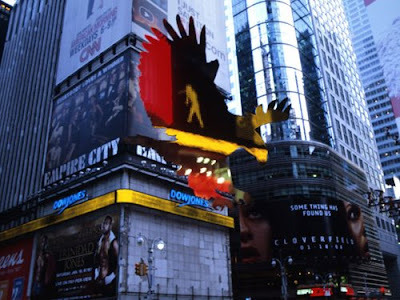 The particular species chosen for these temporary interventions were once were natives of, but are no longer present in, the areas in which their simulacra are placed. 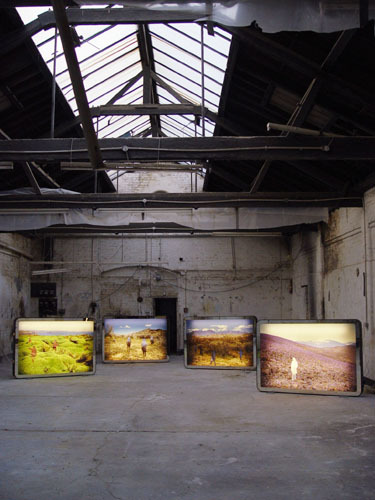 In the gallery, these works are displayed on reclaimed light boxes, recycled from their former lives as advertisement frames in London's subway system. This alone, I love. That this former vehicle for consumer desire gets re-purposed as an art object designed to question those very structures is quite clever --- as well as being a marker of Maslen & Mehra’s commitment to an art practice centered on sustainability. I see the photographs as gateways, allowing one to imagine the encounter with the physical objects, if one is not lucky enough to encounter them in reality. 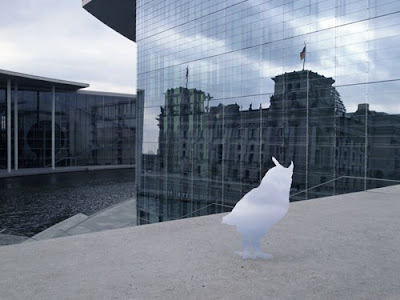 Their perhaps more potent existence is as these public sculptures/installations. 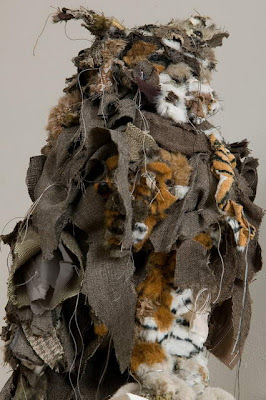 Maslen & Mehra’s animal shapes, rather than being ‘filled-in’ representations, reflect the urban environment around them --- displacing their identity outwards. They are creatures which share our space, but only as cut-outs, windows, absences. 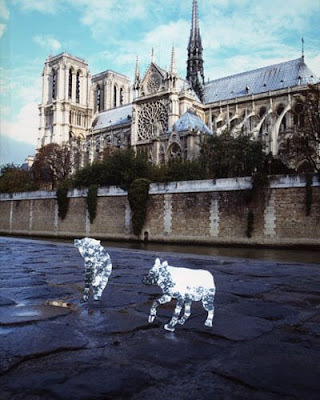 These mirrored forms call out the very thing that has displaced them --- confronting us with the the phenomenon of habitat loss, species driven to extinction, and our own alienation from the animal kingdom and the natural world. When actually encountering the works in situ, I am compelled to imagine, what one would also see is oneself --- reflected in the animal form. A question directed towards our own ersatz dissociation from the animal clan. We too become the animals on display, running in the same pack as these silver ghosts. When looking at these lost creatures, driven from the world we have created, we look at ourselves, trapped inside the built environment, faces shining back from inside of haloed animal bodies. This idea of the mirror is key to the thorough consideration of these works. It is what takes the sculptures beyond facsimile. The mirror interrupts ‘the gaze’ --- a traditional signifier of the viewer’s ownership over the object/person/animal who is being viewed, by reflecting that gaze back upon the viewer, reversing the power dynamic. Acknowledging the act of looking and being looked at as equally powerful, and giving agency to both beast and landscape encapsulated in it’s form, Maslen & Mehra’s sculptures force us to confront our complicity in the situation played out by mirror-forms --- the shifting of the environment to managed and manicured, the dispersal of species from their traditional habitats, and our own loss of beauty (in the world and within ourselves) when these creatures disappear from our collective lives. 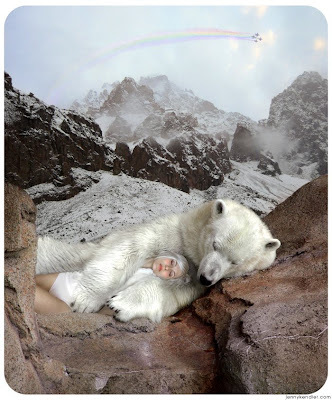 For the many human beings on the planet, especially those in cities, where half of humanity will live by the end of 2008, encounters with animals are now rarefied events. We generally only encounter other animals in mediated situations: in zoos, on televisions, as calendar icons, as feral creatures in our cities, on the occasional managed safari. 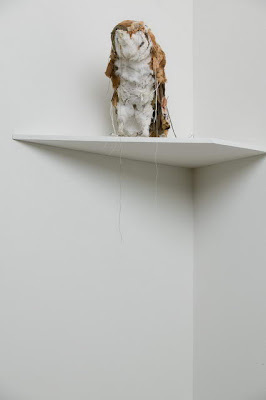 Maslen & Mehra’s sculptures set us up to consider just how much we may be missing. What do we forfeit if we continue to allow these creatures and environments to be driven from the Earth? To see a sea eagle dive for a salmon, drops of water flashing as talons meet river. To walk the woods in the crisp winter air, and catch a shiver up your spine upon finding fresh wolf tracks crossing the snowy path ahead. 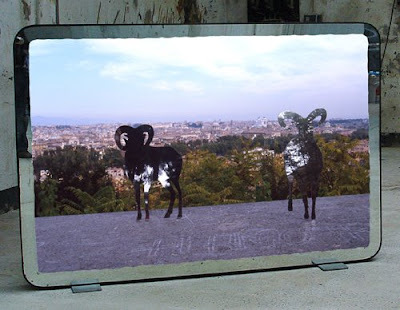 To see an ibex silhouetted on a far-off rocky crest, pirouetting, boulder to boulder, so nimbly that it makes you dizzy. 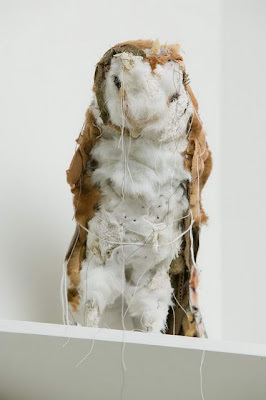 To hear the enormous ‘shushing’ sound of owl’s wings right above your head on a moonless night. Surely, these are things worth saving. Maslen & Mehra’s mirrored creatures are phantoms, fragile and impermanent --- spectral reminders of the relationships between habitats and inhabitants that no longer exist. 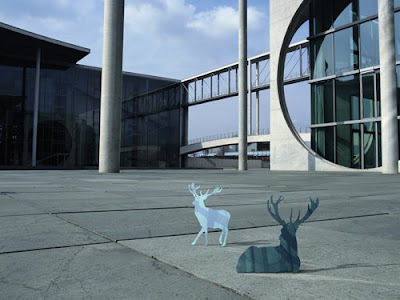 They are apparitions from the zoological garden of the distant pre-urban past. 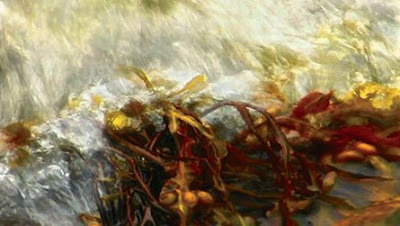 These works, however, are not simply mournful. The mirror throws things back at us, but it can can also be a doorway to a new way of thinking. Mirrors show us ourselves, but if we find that reflected image unsatisfying, they can be a tool to focus and ignite the desire for change. 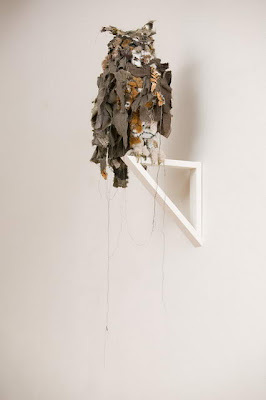 These works, while reminding us of the currently untenable situation we have created with our environment, are none-the-less hopeful and generous --- and allow us, the viewers, to see ourselves through these figures of possibility. They invite us to take a trip through the looking glass to a past where cities once were forests, skyscrapers were sequoias, and plazas were open glades where deer could graze. Simultaneously present and absent, these works help us to recall not only what no longer is, but to imagine, with a change in vision, what possibly could still be. 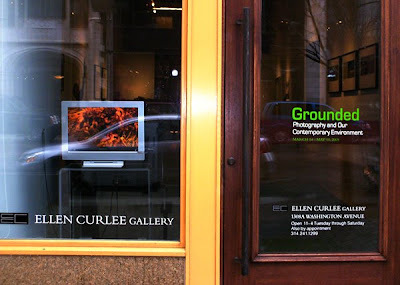 Grounded: Photography and Our Contemporary Environment is an exhibition bringing together international photography and video art, focusing on the complex and dynamic interrelationship between humans and the Earth, while addressing the environmental troubles currently confronting us. 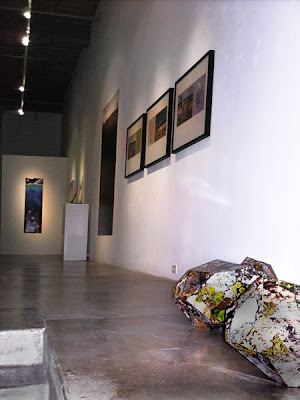 The theme of the exhibition was developed in partnership with the St. Louis Earth Day organization, as a result of their expressed interest in adding a collaborative and artistic component directly involving the community. The photographers represented in Grounded are among a growing movement of global artists who are critically addressing environmental issues such as climate change, extinction and conservation. These artists believe that art can play a critical role in providing creative insight into these challenges. 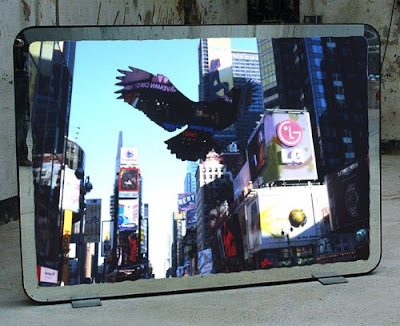 Grounded proposes art as a way of creating a better understanding of our relationship with our environment, as well as a way to explore the renewed role of contemporary art as a leading force in the global debate about the future of our planet. If you're interested in reading more, the show's curator, Dana Turkovic, wrote and article called Human/Nature about the theme of the show for St. Louis Magazine. Malcom Gay wrote this piece, Grounded for Life, for the River Front Times.